At Volunteer Victoria we believe that volunteers turn ideas into reality and potential into probability. We believe that volunteering changes the way people feel about themselves because volunteers connect with places, causes, and ideas that matter. We believe that everyone, regardless of age or stage of life, deserves an opportunity to volunteer and to make a difference. You may have other ideas about how you want your dollars to be put to work. If you would like to talk to one of our staff about your ideas or about making a donation or legacy gift please contact us or visit our Giving Page through Canada Helps. We are a transparent organization. We have 5-years of audited financial statements online for you to review. We are always happy to answer any questions you may have about our organization or our impact. 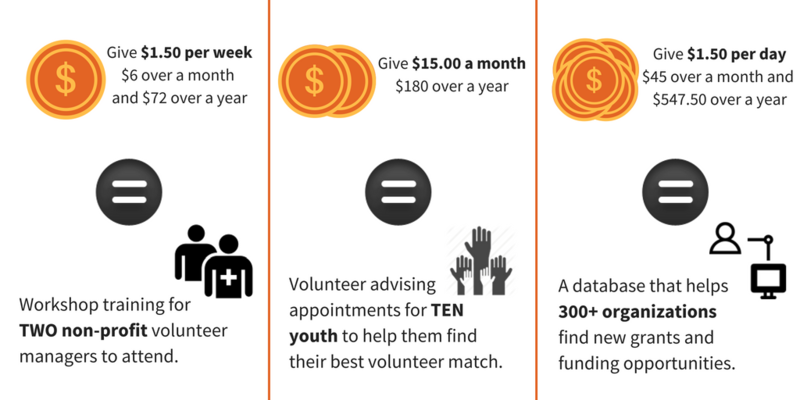 Only you know when and how you want to make an in-kind or financial contribution and how much you wish to invest in volunteerism in your community. Volunteer Victoria makes it easy to donate and keeps you in charge. Call, e-mail or drop by and visit our office to learn how your partnership can impact volunteerism in Greater Victoria! Your investment in Volunteer Victoria makes a lasting contribution to the strength of our community.